I tend to do pretty well for my birthday dinners. Even when they are a month late. My folks are here this weekend, in part to take in the Carnegie International and in part to celebrate my birthday, which, uh, yeah, was a month ago. As it usually does, that involves a nice dinner out. And boy do I wish I had pix of the food we had. I started with carpaccio, sliced so thin that the touch of a fork almost made the beef melt. Topped with a slice of nutty parmigiano reggiano, a little arugula and drizzled with olive oil? Oh my. And then there was the gnocchi. Butternut squash. Ricotta. And topped with a wild boar and black truffle ragu: big tender chunks of roasted pork that just dissolved in the slightly earthy gravy. My folks both had linguine with a mix of shellfish — they were both very pleased — and Mrs. Crappy’s dinner, a pork chop stuffed with speck and smoked mozzarella, was delicious. We drank well too. While I walked back to the restaurant after parking six blocks away, Mrs. Crappy ordered me a Brooklyn, a white Manhattan made with Wigle’s rye, and the barbera recommended by our server was a very nice pairing with my entree. A great meal, perhaps the best I’ve had in Pittsburgh. Clearly, I should have birthdays more often. 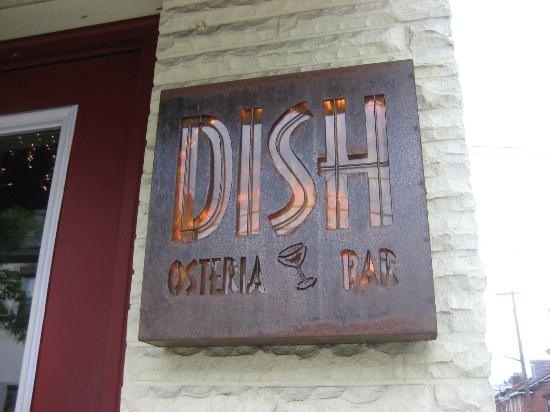 Dish was a favorite of Dan and mine when we lived on the South Side. Dan knows the owners. We are way overdue for a visit. Next PostNext 9. the best gift ever.